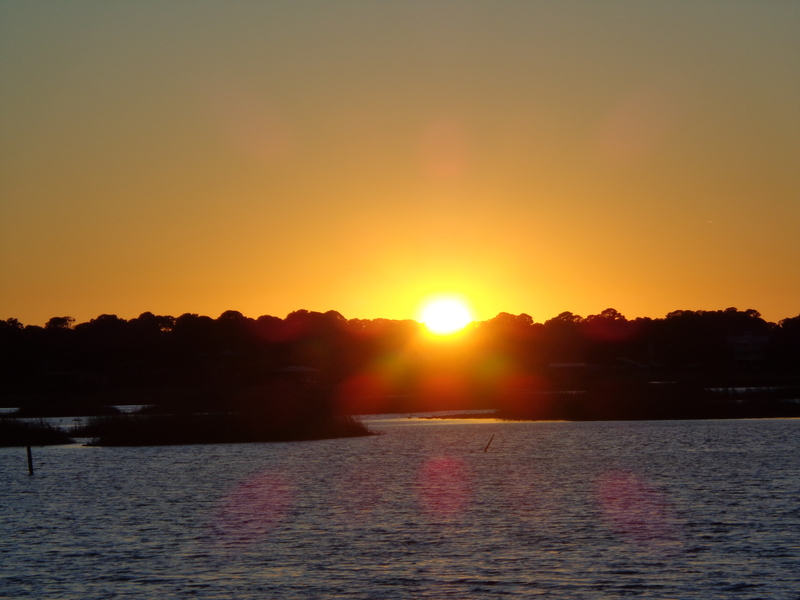 Last week we had a wonderful time visiting with Forrest and Mary, whom we met in Cedar Key, Florida. They are from Wisconsin, and are slowly making their way out to the Southwest, for the winter. 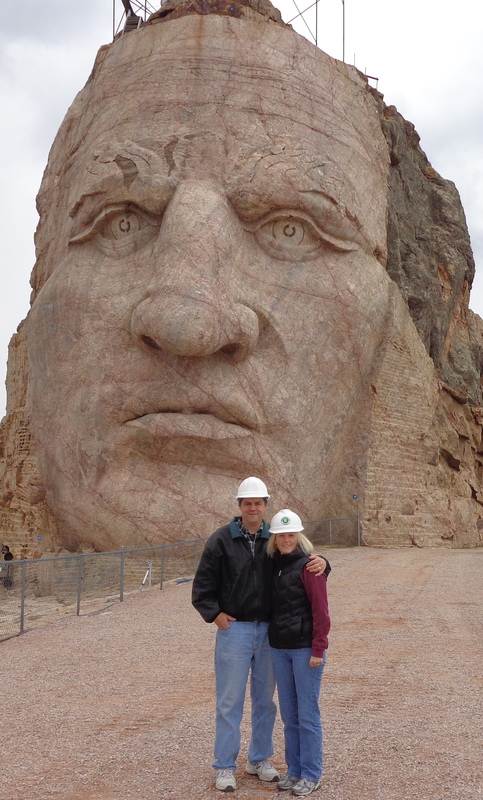 We all managed to get many things off our ”bucket list” during their visit. Hopefully I can start getting caught up on my blogs, as I am very behind due to the lack of reliable internet. 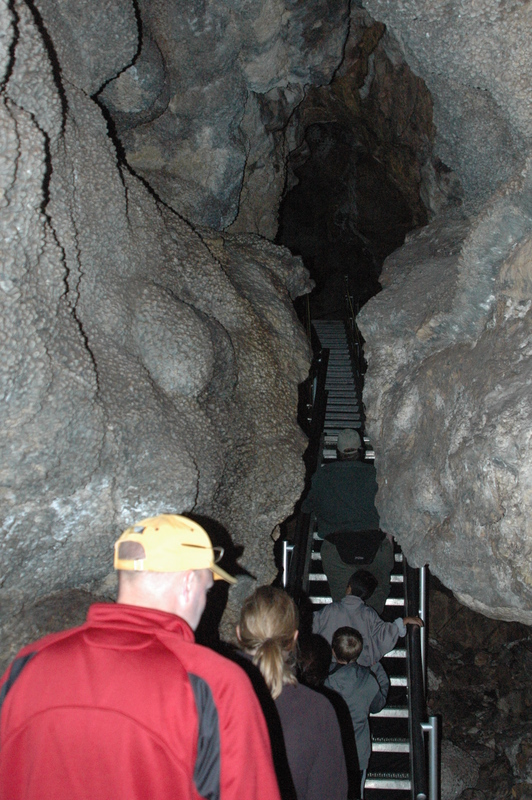 There are many cave tours available in the Black Hills area, and so far the two best ones (in our opinion) are operated by the National Park Service. 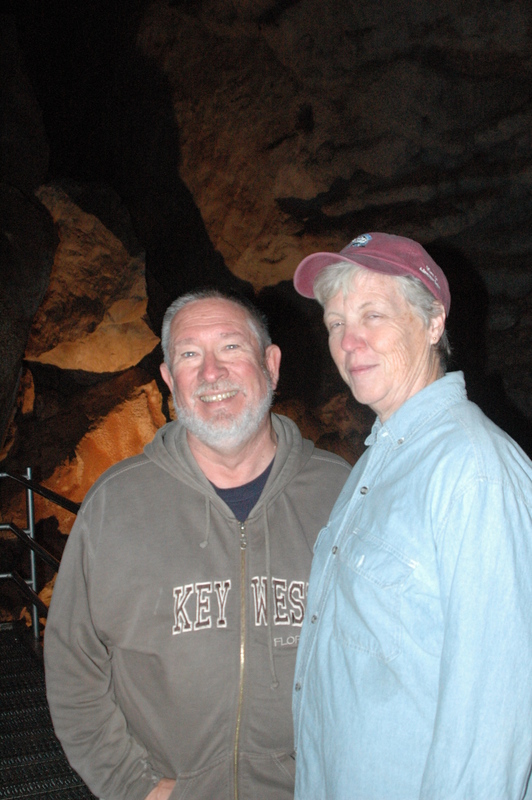 We have previously visited Wind Cave National Park, and went with Forrest and Mary to Jewel Cave National Park. 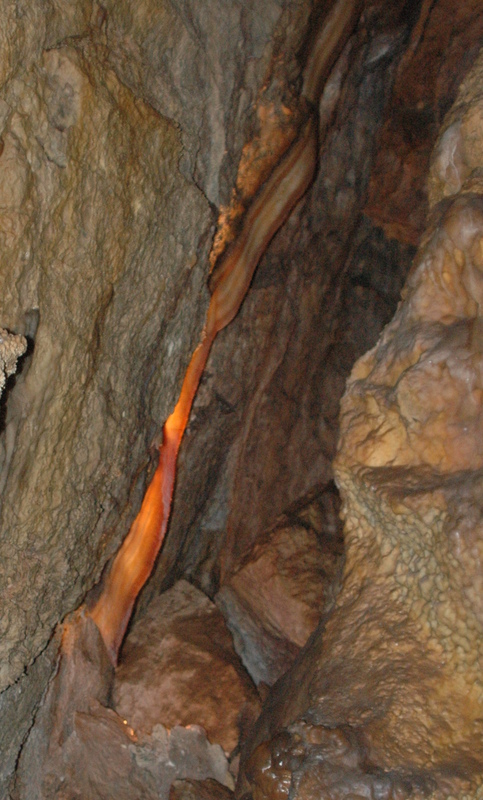 Jewel Cave was discovered around 1900 by two brothers, Frank and Albert Michaud, and their friend Charles Bush, when they heard some wind blowing into a hole in some rocks. They discovered a cave full of sparkling calcite crystals, and made a claim to this “jewel mine.” Soon they realized there were no valuable minerals in the cave, and turned it in to a tourist destination instead. 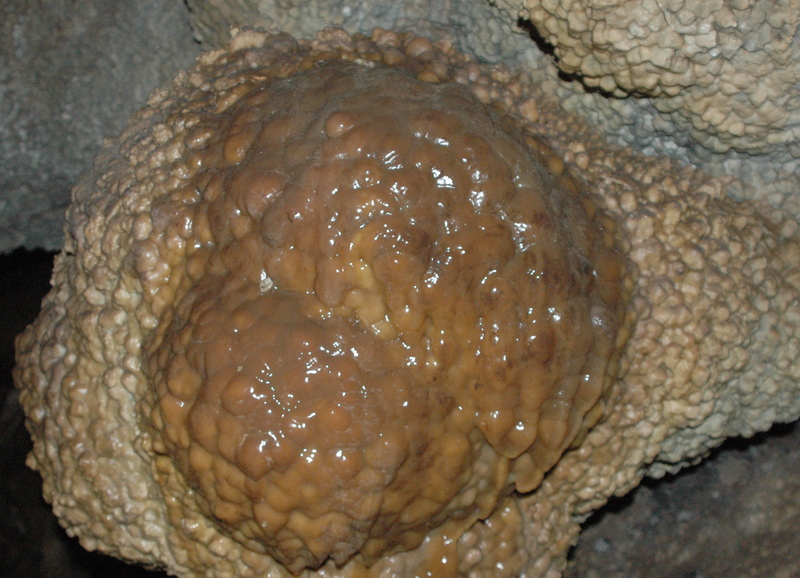 Since “calcite crystal cave” doesn’t sound too exciting, they named the cave Jewel Cave. The National Park Service took over the cave in 1908 which has protected the cave. In 1959, Herb and Jan Conn were asked to join a cave expedition, and they spent the next 21 years discovering over 65 miles of additional passageways in the cave. After they retired in 1981, additional explorers have continued discovering and mapping additional passages. 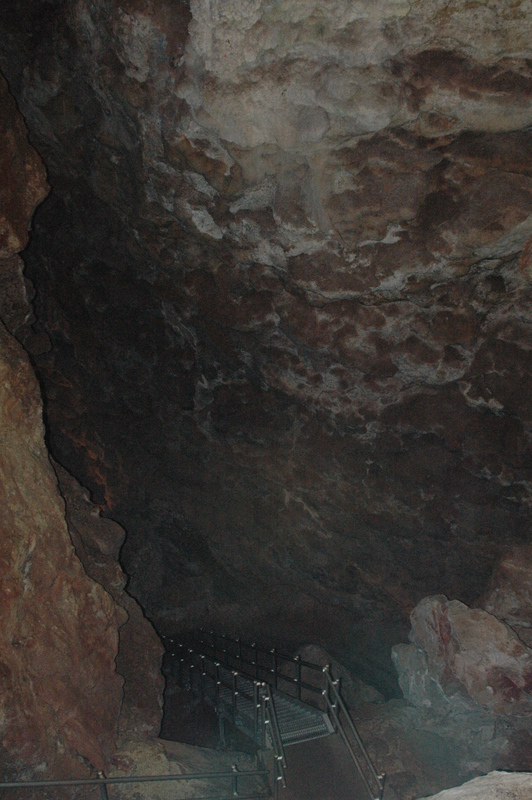 To date, over 170 miles of passageways have been discovered at Jewel Cave. They offer four different cave tours, and we opted for the Scenic Tour, which is the most popular of the tours (and free with our VIP pass). At $12.00, it is an excellent value. The tour covers about 1/2 mile of the cave, in 1 hour and 20 minutes. You take an elevator down into the cave, and there are about 700 stairs to climb up/down. Of all the cave tours we have been on so far (still have several others to blog about), this would be the best tour for anyone who is claustrophobic, as this is a very wide open, cavernous cave. 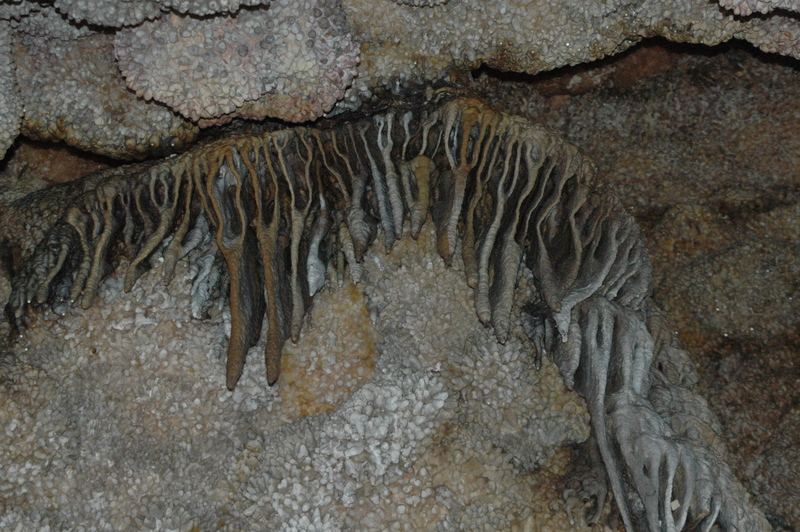 Photography inside a cave is hard to do, because of the lighting, and lack of depth perception in photographs. To get an idea of the size of this cave, you can see the stairs in the photo below, showing how far down we will be going. And then back up again to another area of the cave.. Into a larger room of the cave. This cave has several interesting formations. I thought this piece of flowstone looked like a brain. They call this very thin piece a soda straw. Curved pieces of calcite on inclined walls and ceilings create these interesting “curtains”. This piece of “bacon” is over 20 feet long. 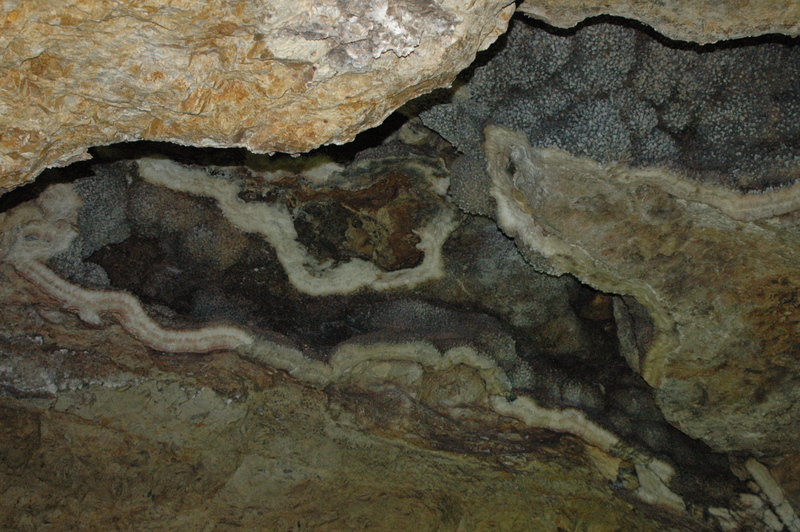 It is also formed from calcite, but has magnesium in it as well, which provides the coloring. This was our favorite formation in the cave. Again, the photograph does not display the enormity and full color of this piece of “bacon”. Jewel Cave is well worth the visit if you are in the Black Hills. 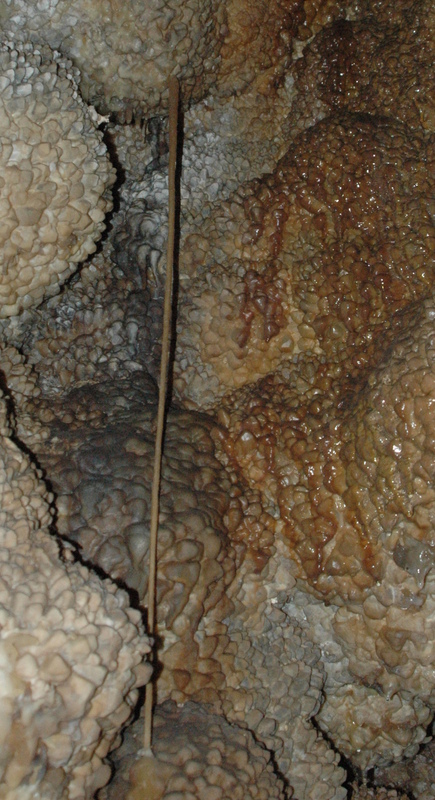 It is estimated that only 5% of Jewel Cave has been discovered, based on barometric pressure readings of the cave. Future generations will be able to continue enjoying new discoveries for years to come. 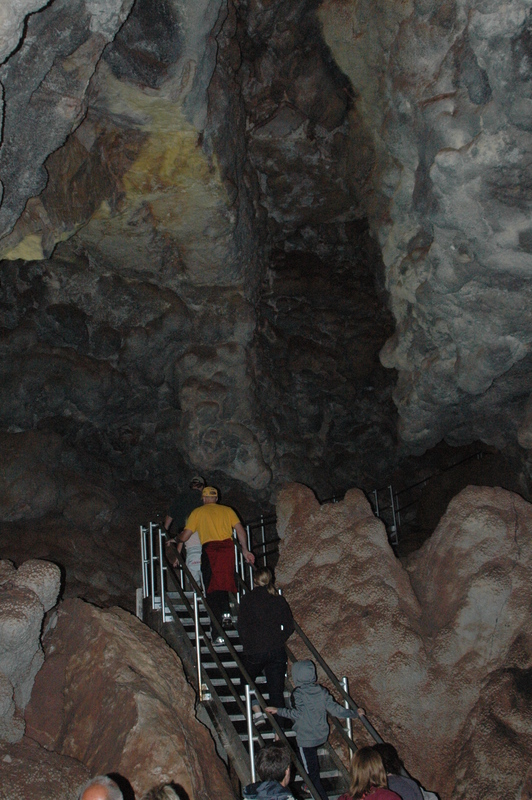 Many visitors inquire about which cave to visit, Jewel Cave, or Wind Cave. If you have the time, I would recommend both, as they are very different. If you are short on time, or a bit claustrophobic, then stick with Jewel Cave. And in our opinion, the National Park Service has done an excellent job in taking care of and preserving both of these caves. It was one year ago today that I left my job as a CT Technologist at a Level One Trauma Center. Working at a hospital helps to really put life in perspective. Many people have plans to do things when they retire, but sadly, not everyone lives to see that day. This was one of the reasons we decided to throw caution to the wind, and live our dream now. I have spent the morning pondering all the changes we have made in the last year, and trying to come up with a list of things we would have done differently. Instead of getting both cell phones through Verizon, we would have had one from Verizon, and one from AT&T. That way we would have better coverage and internet options. We will probably make that change next year when our contract is up with Verizon. 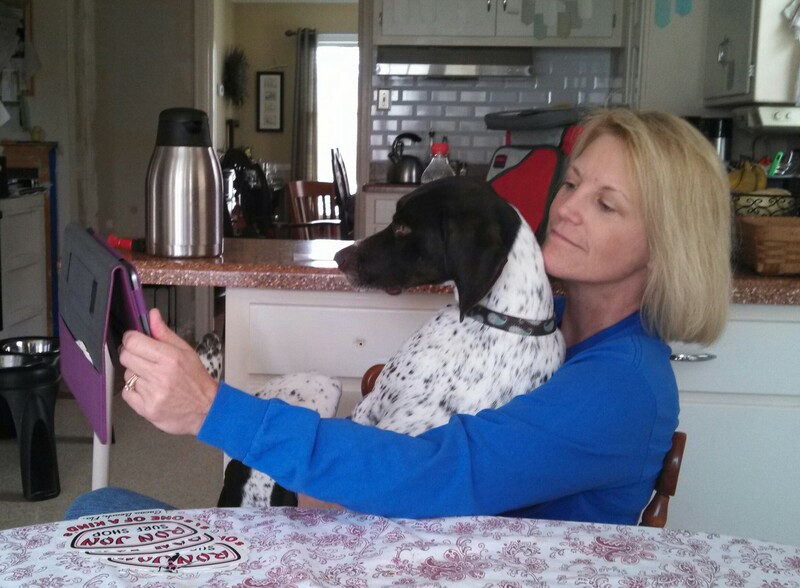 Other than the cell phone, we would not have done anything else differently. Then I started to come up with a list of things that I don’t like about our new lifestyle. Going to a new person/place every time I get a haircut is the only thing that I really do not like. As Dan has told me a few times, “Don’t worry, your hair will grow back”! We have been asked many times over the past year if we had any regrets, and we have none. We have met so many wonderful people in the past year, and have seen and experienced many wonderful things. It is hard to believe that only one year has passed since I stopped working a regular job, and started working seasonal work-camping jobs. hmm, a potential workamping job? 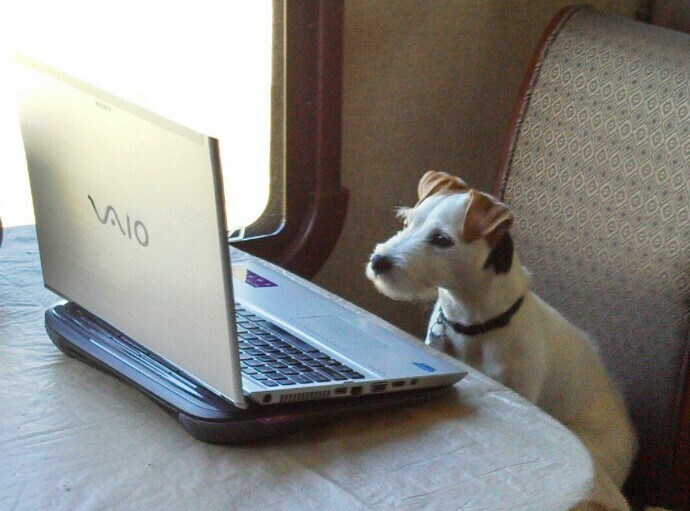 For several years, I have been following a number of blogs related to the RV lifestyle, and it has been fun getting to meet many of the wonderful folks who have been so helpful in sharing their experiences. 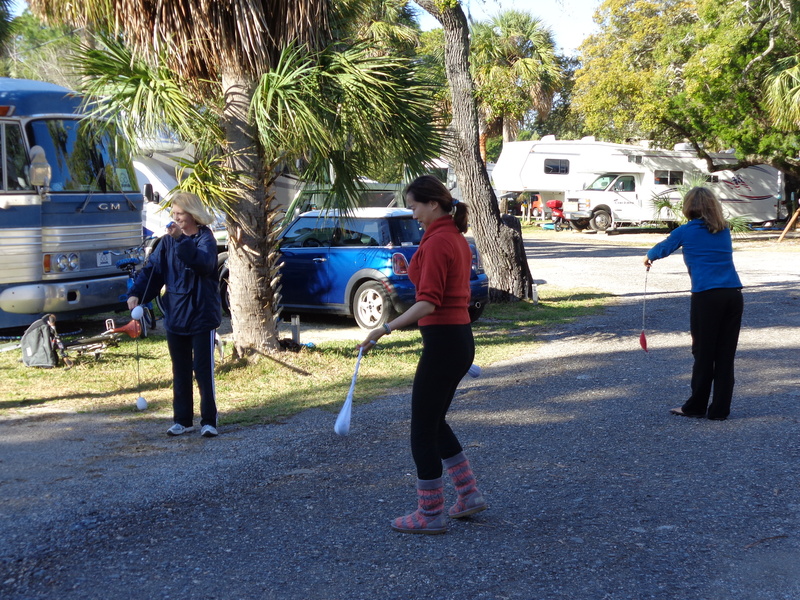 Our fellow Crazy Horse co-workers, Phil and Rudee of Workin RVers, and Steve and Joan of FOSJ, fellow Amazon co-workers Karen and Al of Wish Upon an RV Star, Chris and Cherie of Technomadia, whom we met in Cedar Key, Florida. 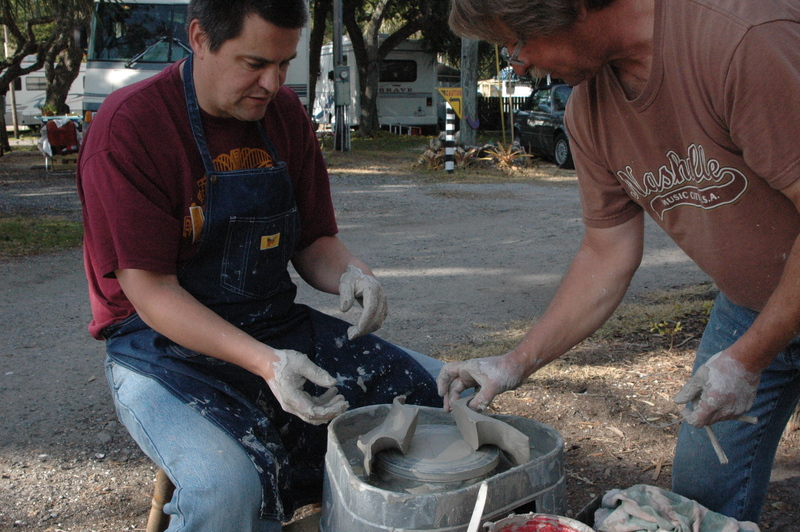 Someday we hope to meet up with Nick and Terry of The Gypsy Journal, as well as Howard and Linda of RV-Dreams. All of these great folks have the same thing in common, they are earning a living on the road, and enjoying their life to the fullest. 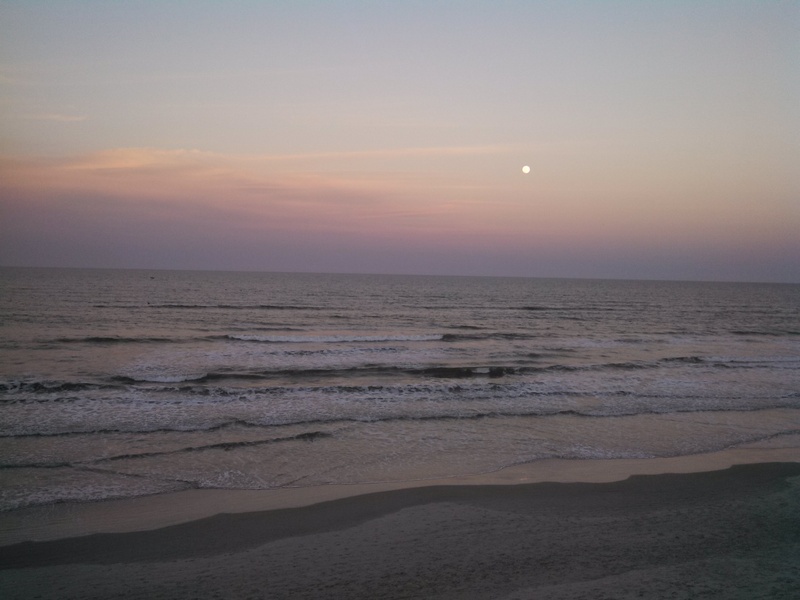 We have also learned to take time to watch the sunset.. When you live life on the road, and are mobile, you really don’t pay much attention to the calendar. We look at the year in segments….a few months here, a few months there, and then winter in a warm place. So when we headed out on our day off to Bear Country USA, we completely forgot that it was the Fourth of July Holiday weekend. Until we pulled in to the entrance and were stuck in long lines…..! 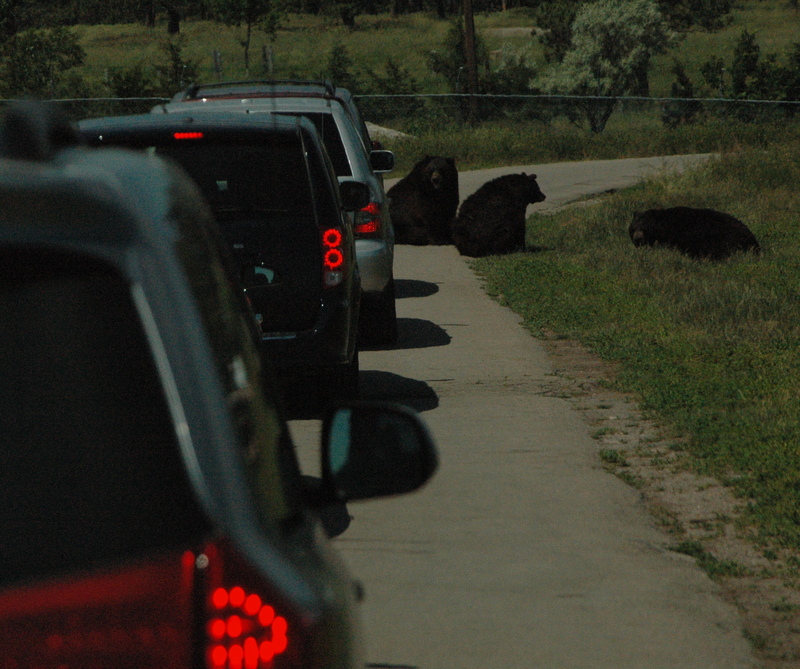 Bear Country USA, a drive-thru wildlife park is about 8 miles South of Rapid City. 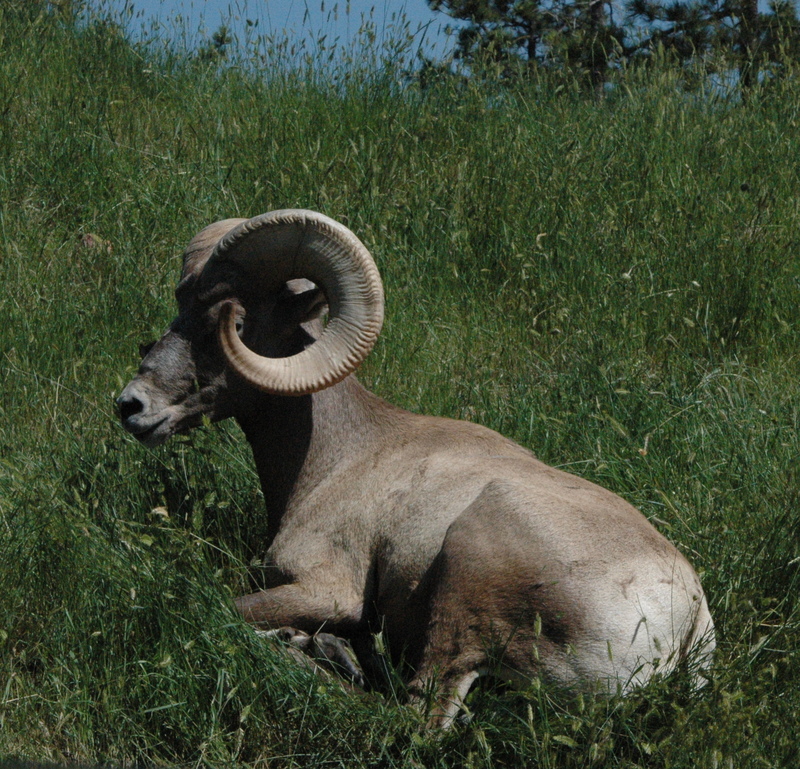 Open since 1972, the park allows animals to roam free on over 200 acres, while us humans remain caged in our vehicles. 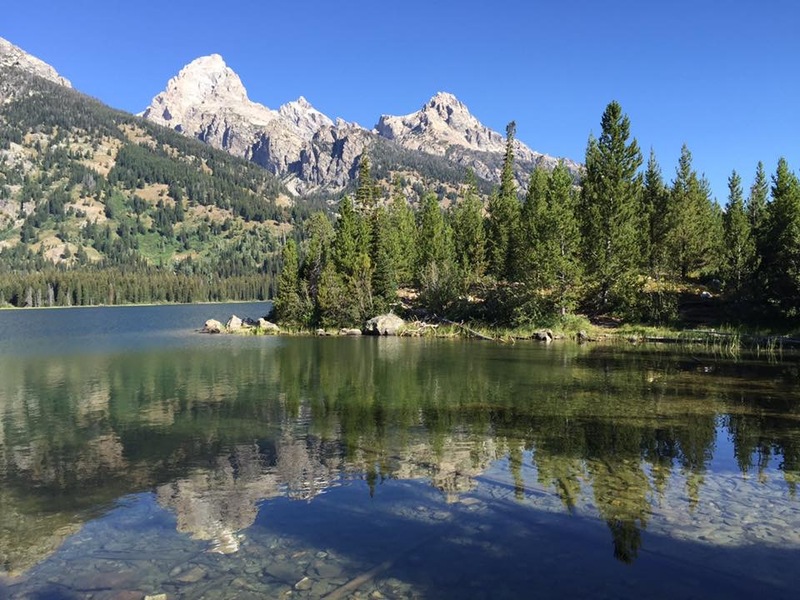 The park has elk, wolves, reindeer, big horn sheep, rocky mountain goats, buffalo, and the largest privately owned group of American Black Bear. Each species is sectioned off from the others, in case they don’t ‘play nice’ with each other. 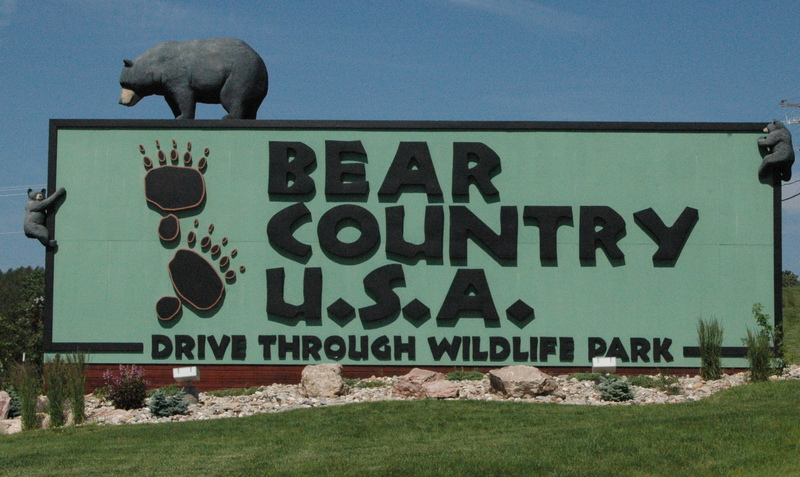 Bear Country is open from May to November, (the bears still hibernate for the winter), and costs $16.00 per adult (maximum charge of $60 per vehicle. (We received free admission with our VIP pass). 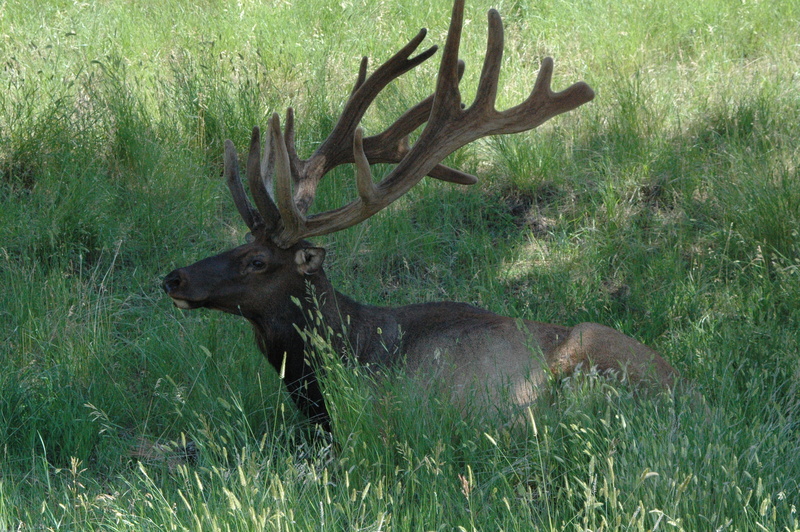 The tour starts with a drive through the Rocky Mountain Elk area, which has many beautiful Elk, including this guy, just lounging right by the side of the road. This is the first time I have seen Elk, and they are quite an impressive animal. We encountered several Arctic Wolves in the next section, including this one licking its chops as it walked past my window. I opted to keep the window closed, so there is a bit of reflection on the photo. keeping the window up tight! 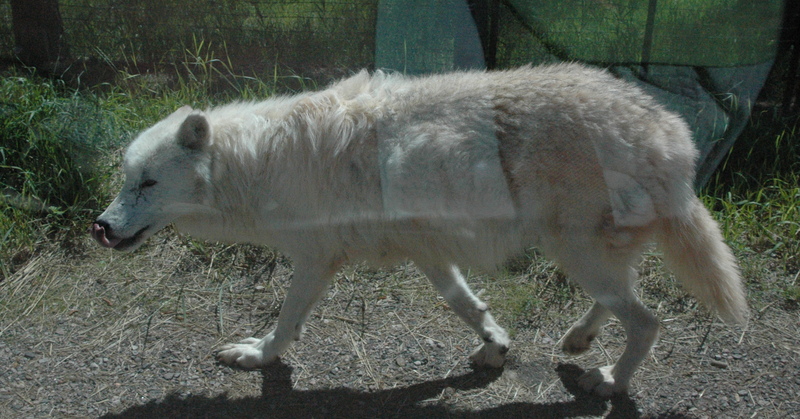 When the wolf was at a safe distance, I rolled the window down for a better photo. 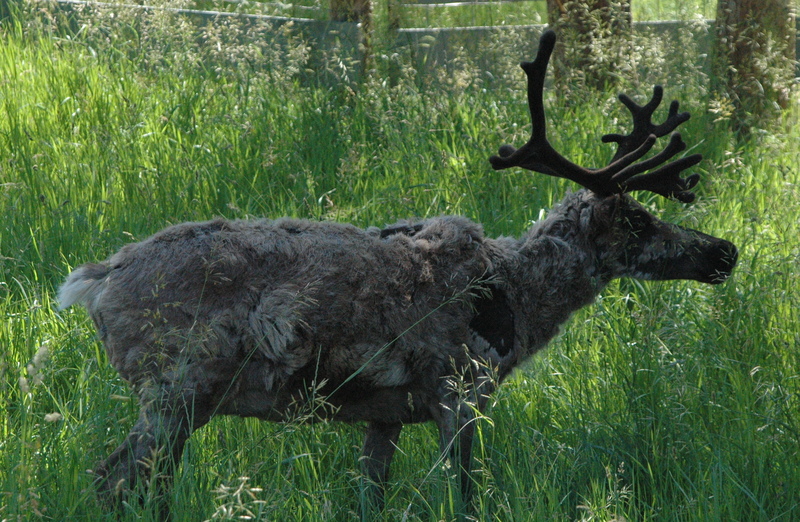 Although we didn’t see Rudolph, there were quite a few Reindeer, counting down the days until they have to go back to work at the North Pole. is this Dasher or Dancer? And this one as well, happy to pose for photos, it seems. 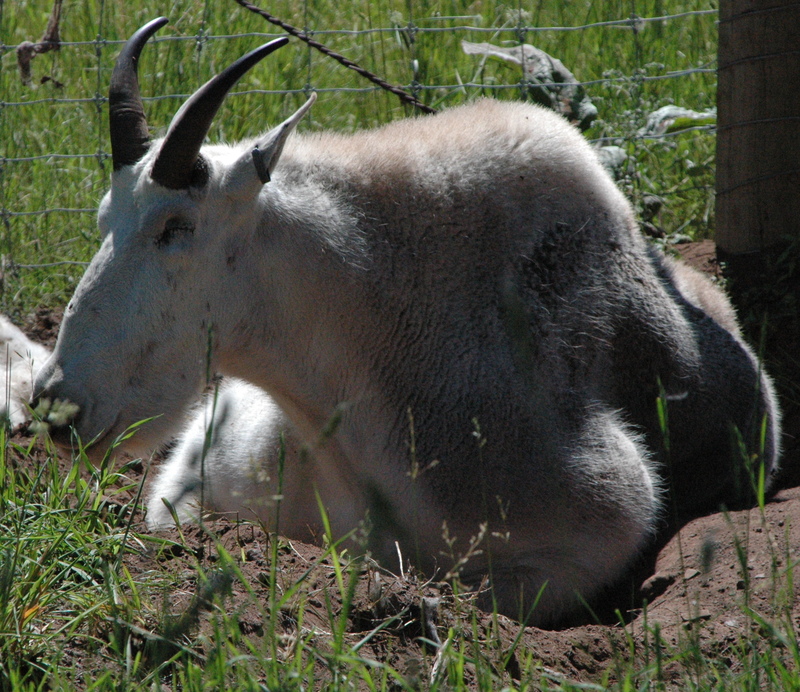 The Rocky Mountain Goats were busy snoozing. And then we entered the Black Bear area, where you are not permitted to roll down your window (actually you are not supposed to do it in the other areas), and they have a person with a shotgun stationed in a tower in the middle of the bear area, just in case something goes amiss. 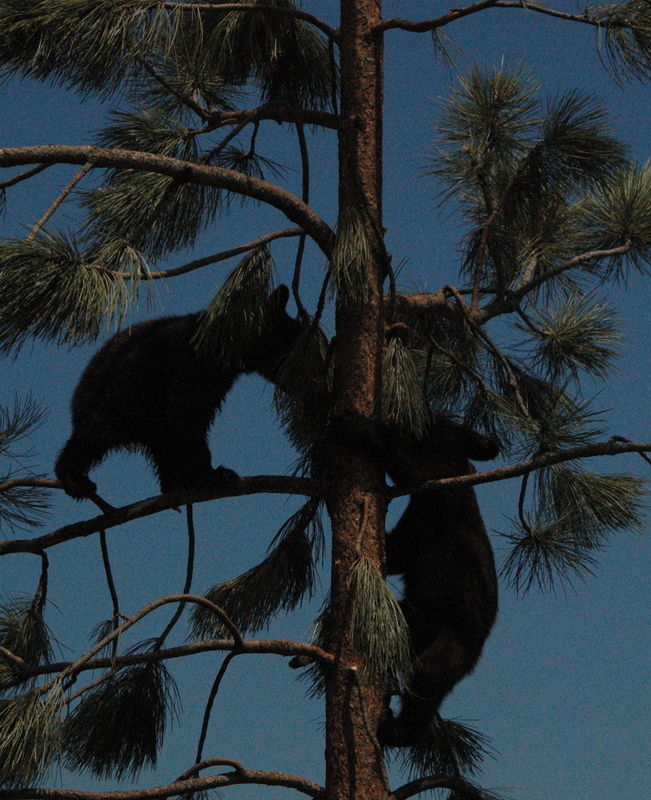 Mating season is May and June for bears, so we weren’t the only ones who forgot that it was July! 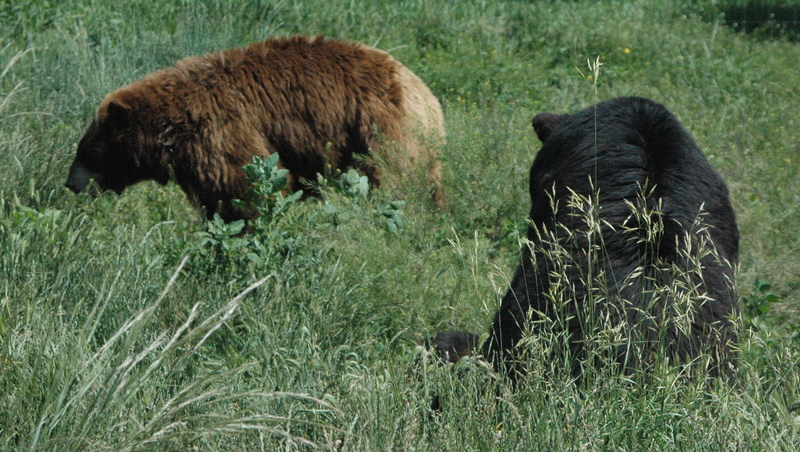 Black Bears can vary in color, from black, brown, cinnamon, blonde and white. In the wild, they live 10-15 years, but in captivity, 15-30 years is the norm. These three bears were causing quite a traffic jam in the park. 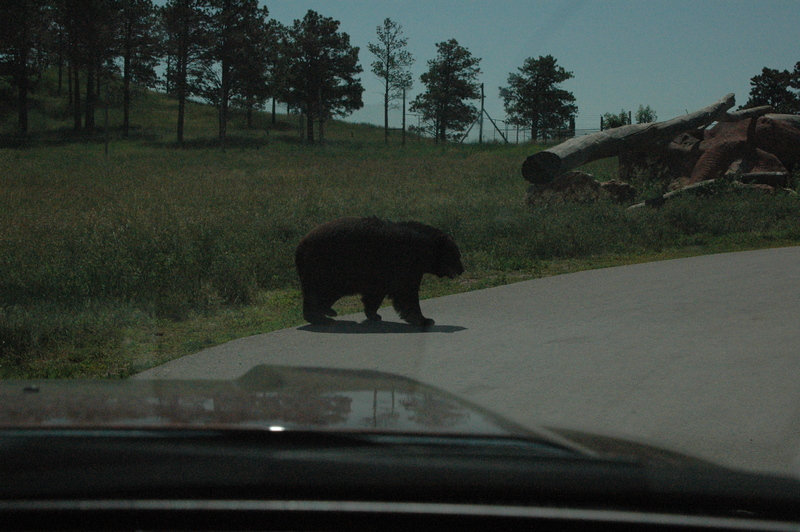 Signs in the bear area indicate you are supposed to continue driving slowly, and the bears will move out of your way. 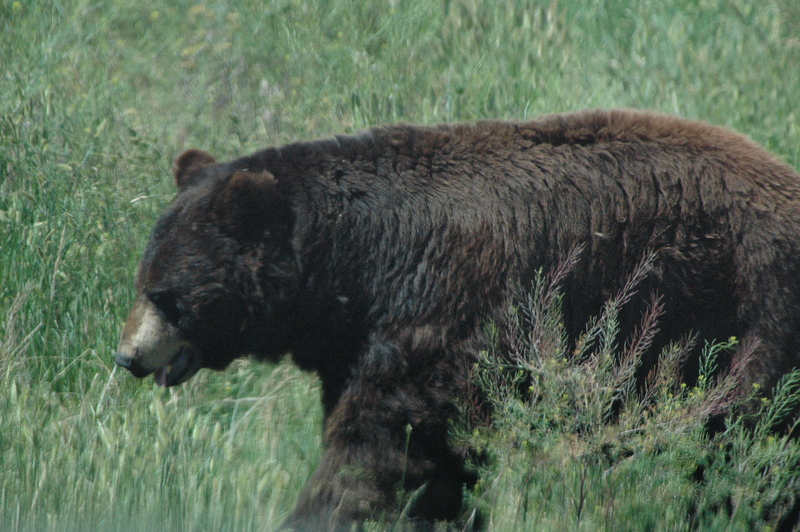 But it is a bit intimidating to have a large bear walking right in front of you! 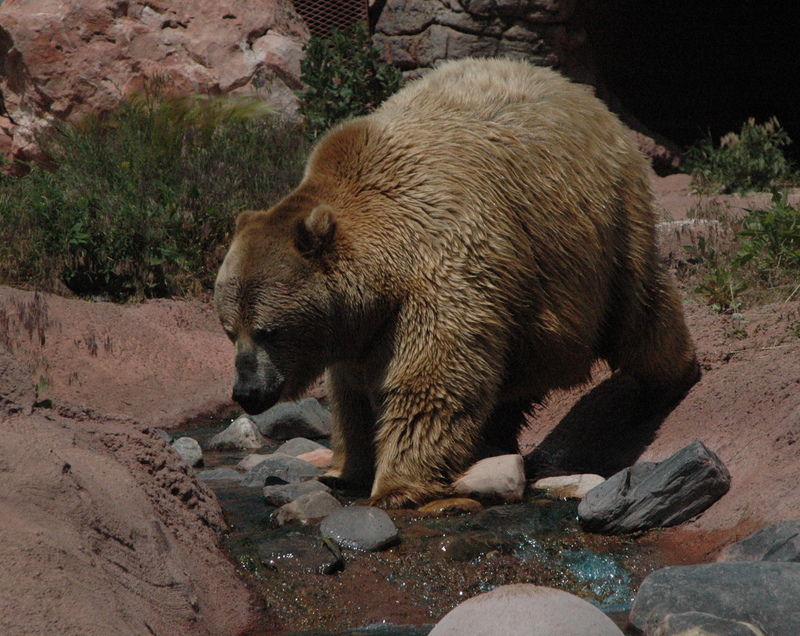 After exiting the drive-thru portion of the park, you can park and walk over to see an impressive looking Grizzly Bear. These bears are identified by the hump on their shoulder, which is from the large muscle used to strike with their paws and dig holes. 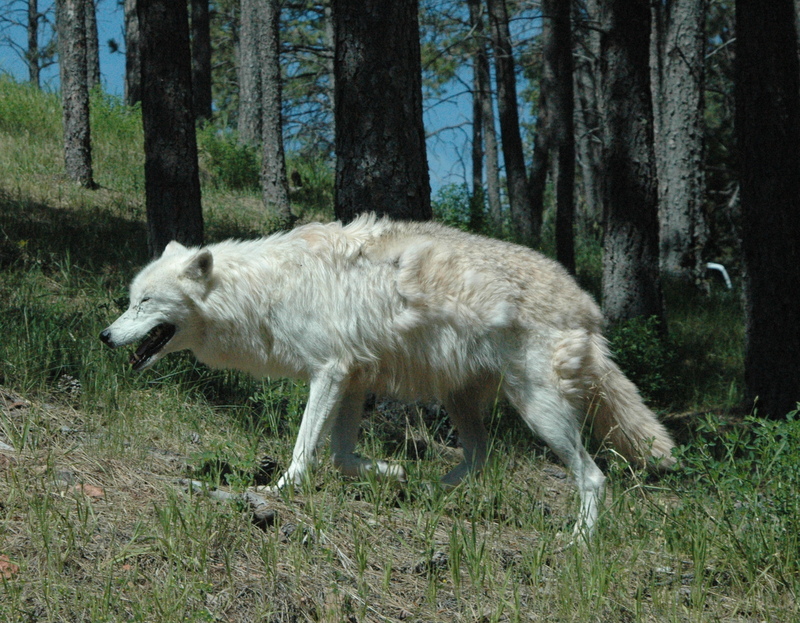 They can run both uphill and downhill at speeds of 35 MPH, so don’t plan on outrunning one of these in the woods! 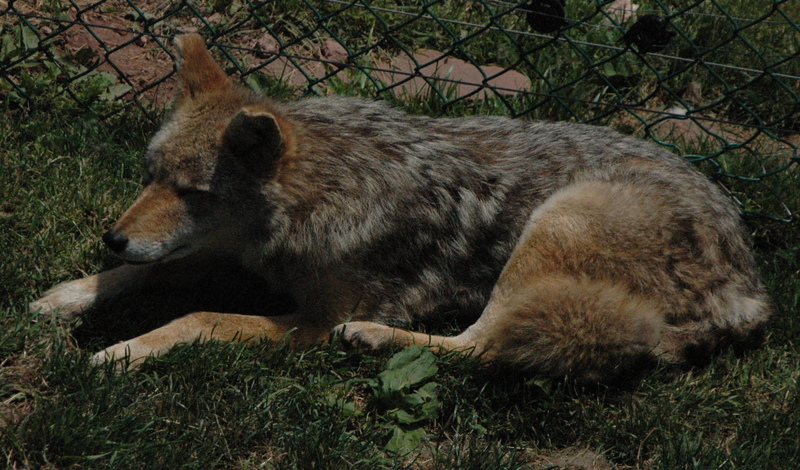 The state animal for South Dakota is the Coyote, which adapts itself to both rural and urban settings. 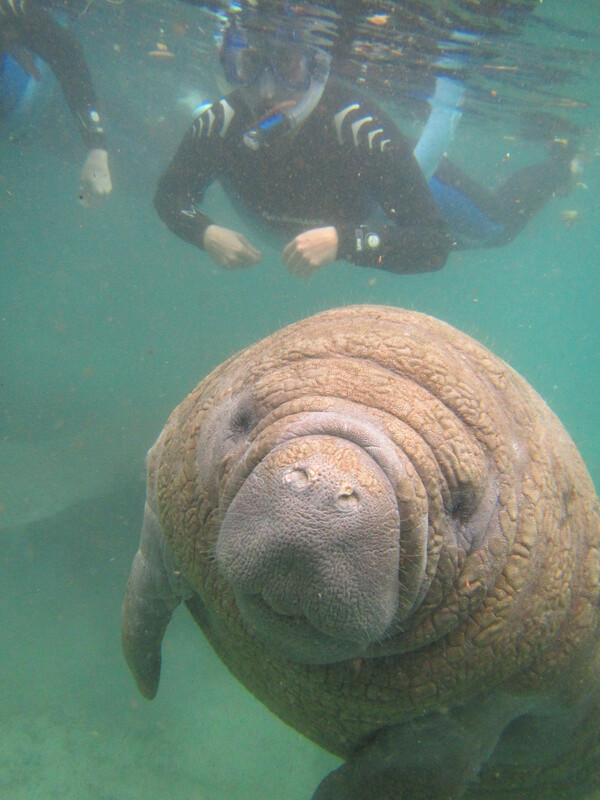 We hope to never encounter one of these, as they have a tendency to eat small animals. 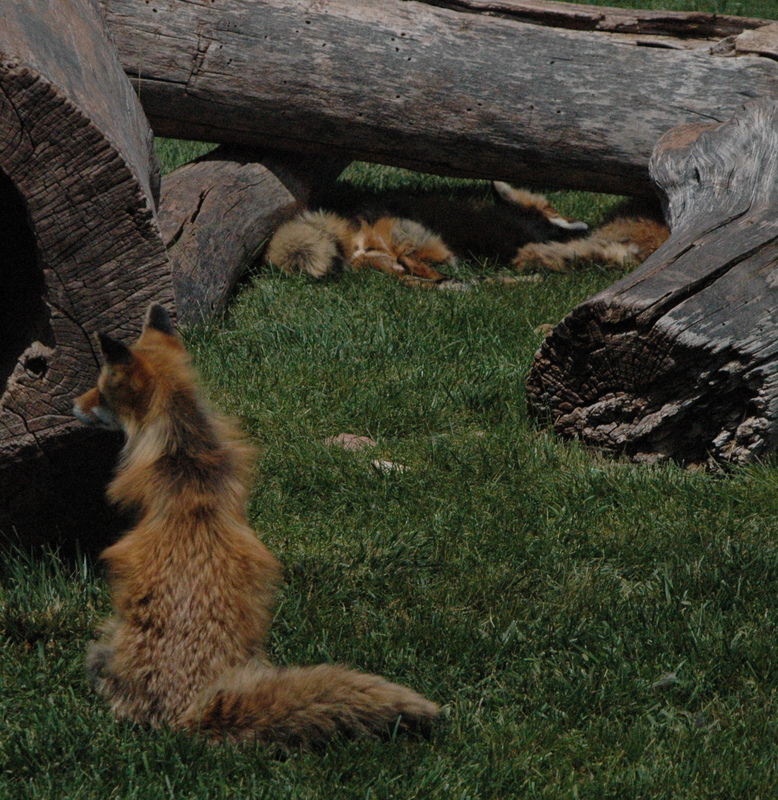 They had several Red Foxes on display. 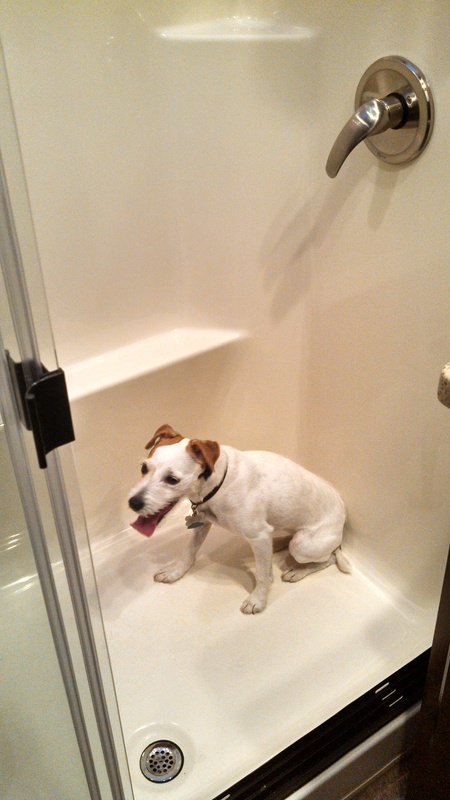 Makena (our dog) was bred to hunt fox, although she is too afraid of most animals, so I am not sure what she would do if she spotted one of these cute little animals. 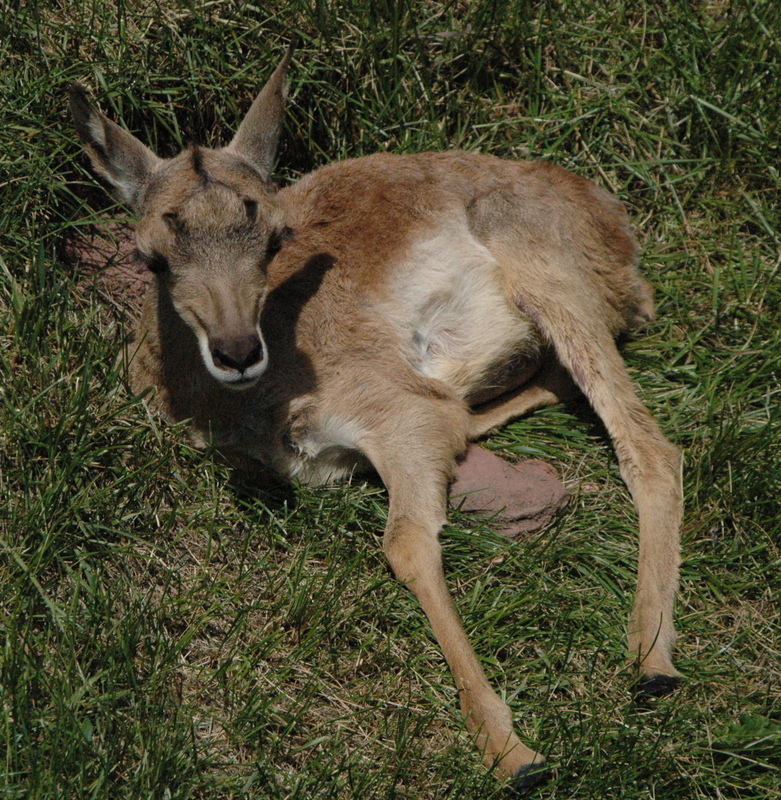 They had a few baby Pronghorns on display. 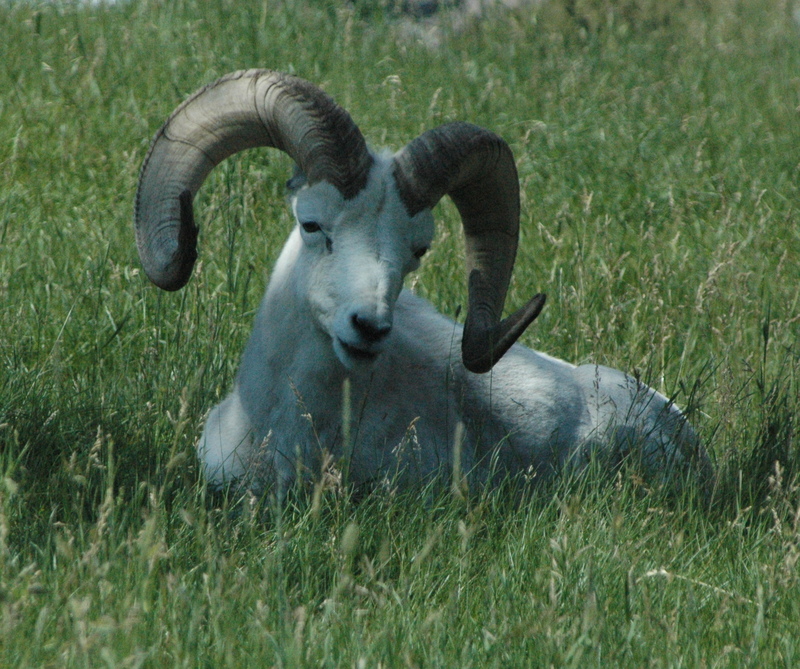 Pronghorns are generally lumped in to the antelope or goat family, but they are neither. They are the sole survivor of an ancient species, and are only found in North America. 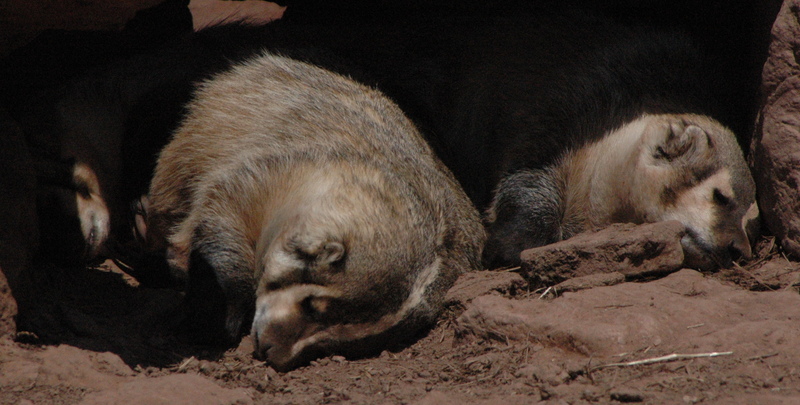 They are the second fastest land animal, with a top speed of 60 MPH, and can sustain speeds of 30 MPH for several miles. Oddly, they crawl under a fence, instead of jumping over one. 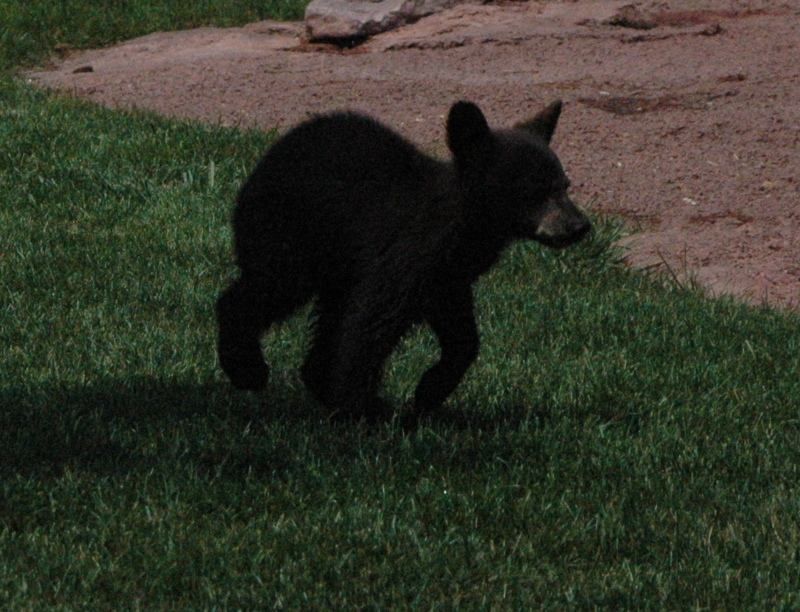 But the highlight of the Babyland area are the bear cubs. I took several videos of them running around. They are so cute! The cubs were born late January/early February. After three months with their mothers, the park weans them off and away from them, for their own protection. In the wild, only 40% of the cubs make it to one year, as many are harmed by the adult males. We both enjoyed the park, and would recommend this to anyone visiting the area. Our campground sits at 5800 feet in elevation, which means we have to follow “high altitude” baking instructions. Or do we? This is our first experience camping at a higher elevation, although I have not yet noticed anything different. I was curious about what changes are needed in baking, so I decided to do a little experiment. When I make a batch of cookies, I usually bake a dozen or so, and then freeze the rest of the cookie dough (much to Dan’s dismay!). Since I had some dough in the freezer that I made a few months ago, I thought I would bake that up, and see what happens with the regular baking instructions. Here are the results. 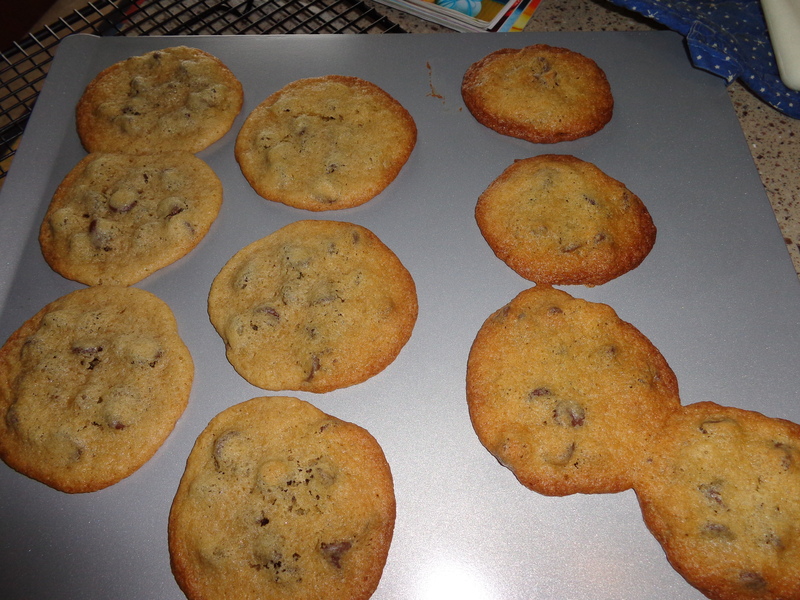 The cookies browned nicely, but were flat and a little doughy in the middle. 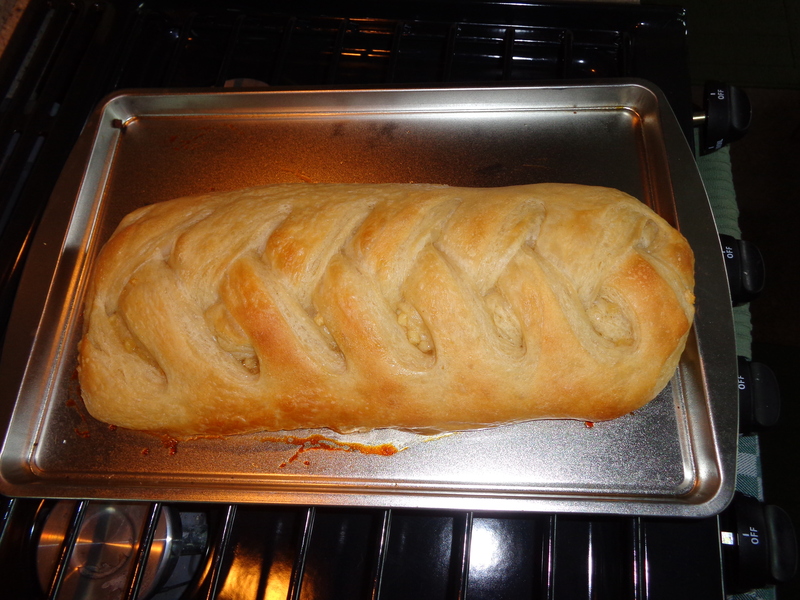 I also had a butter braid in the freezer, which is a pastry that my niece sells as a fund-raiser for her school. We have had these in the past, and they are excellent. I noticed the package had instructions for baking at higher altitude, so I decided to follow those instructions. The difference in baking required a shorter time for the dough to rise (6-8 hours instead of 8-12), a higher baking temperature (350 degrees instead of 325) and a longer baking time, by about 6 minutes. The result? Excellent! 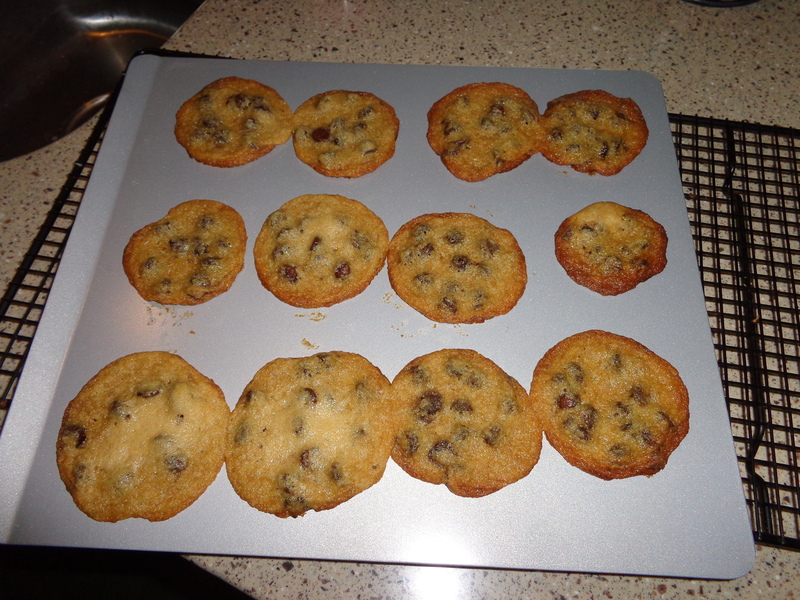 Next I made a batch of cookie dough, this time following the “high altitude” instructions. 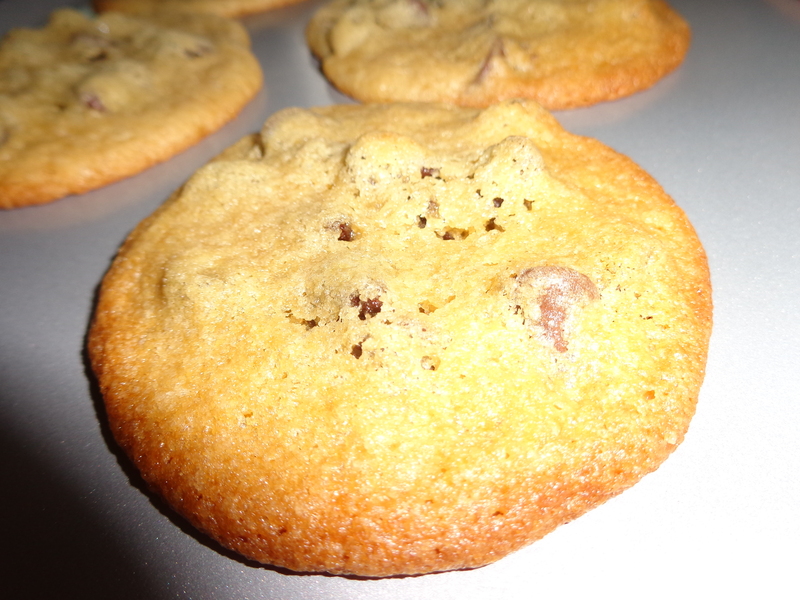 The change in the Nestle’s Toll House chocolate chip cookie recipe required adding 1/4 cup more flour, reducing the granulated and brown sugar to 2/3 cup from 3/4 cup (this is a 1/12 cup reduction for Dan’s math geek friends) , and adding 2 teaspoons of water to the flour mixture. Although from the photos below, the “high altitude” cookies don’t look much different, they were crispier than the non high altitude cookies. We also made some biscuits, which didn’t require any changes according to the box. I forgot to take a photo, but they turned out flat and doughy and took about 10 extra minutes of cooking to make them palatable. I think I will e-mail that company and advise them to change their directions! The higher the altitude, the lower the air pressure. Therefore, food will take longer to bake. 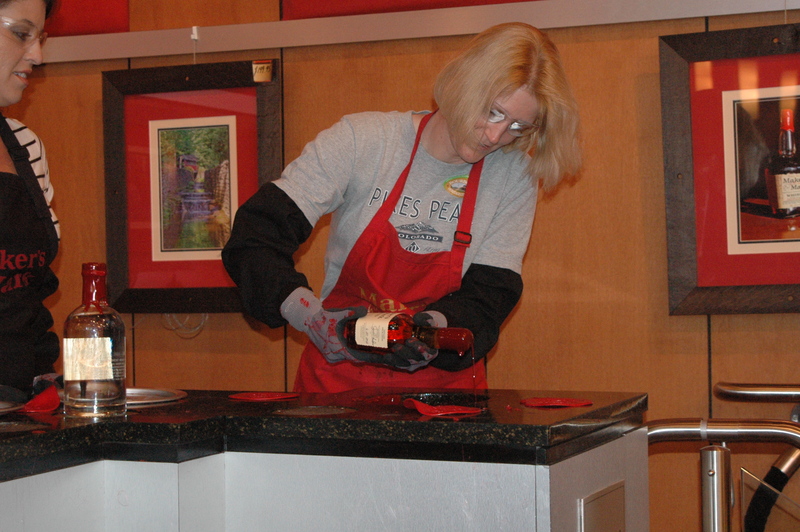 Liquids evaporate faster at higher altitude, so flour and sugar is adjusted to prevent the batter from getting too gummy. 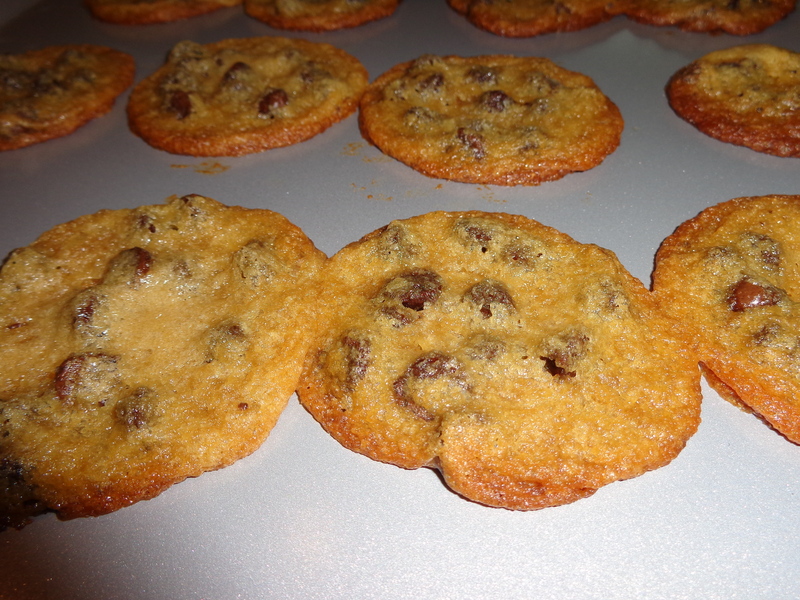 If your cookies spread out, there is too much sugar. Gas expands more at higher altitude, so dough rises faster. Besides baking, we do a lot of cooking in the crockpot. The first few times of using it here, the food was overdone. So with a crockpot, I find the food cooks much faster at a higher altitude. This may be due to the evaporation of liquids at a higher altitude? Last time we were “home”, my mom was showing my cousin Reagan my blog on the Ipad, so I know I need to keep my cousins updated! The park we are staying at is nice, from my point of view. There are only a few other dogs staying here, but they don’t live near me, and they don’t come over to sniff me, if you know what I mean!! There is no designated ‘off leash’ area, which is a bummer, but my parents have been taking me over to the tent camping area to play football (yay!!!) when no one is around. They talked with the other campers who are parked nearby, and no one has objected to me being off leash for 5 minutes a day so I can run around and play catch. I was a bit concerned when a whole group of Boy Scouts arrived, but then they set up all their tents on the other side of the campground. Whew! That would have interfered with my play area. 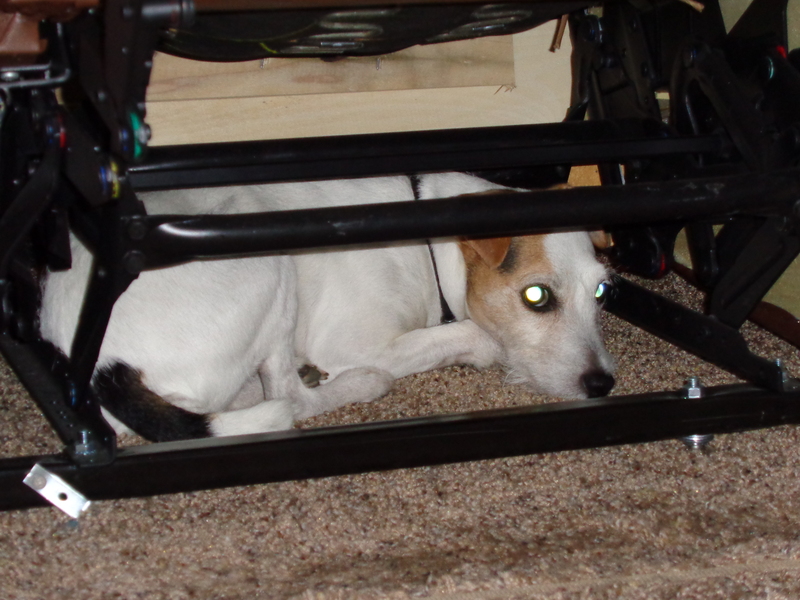 I really think whoever designs these recreational vehicles, should consider making a little cubbyhole where dogs and cats can hide out in bad weather. My dad thinks I should get some puppy headphones, so I won’t hear all the noise! I did have a visitor the other day, Mia, which I enjoyed. 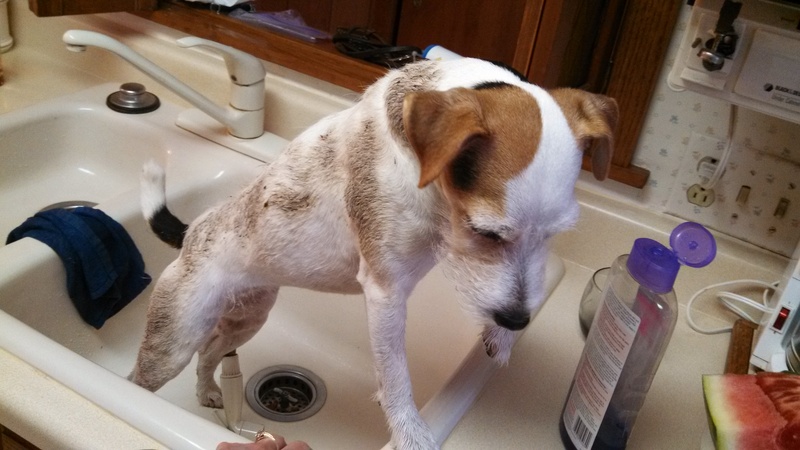 I first met Mia last summer at the Heartland Owners Rally in Goshen, IN. Her parents, George and Iris, are visiting the area and went out to lunch and to explore Custer State Park for a few hours with my parents. Now I’m just waiting to visit with Cooper, so Fred and Donna need to venture out this way! I hope everyone is doing well! If you get a chance, please come and visit me, as I love belly rubs! !